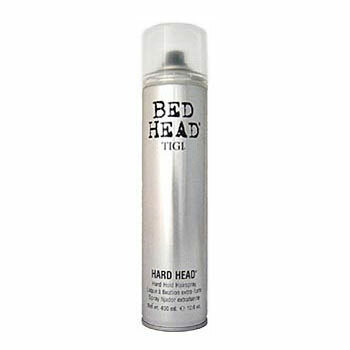 Use Hard Head Hairspray for relentless hold and control. Dries instantly. Be bold. Defy gravity. Hold 10-12 inches from hair. Spray over the styled hair or spot spray as desired. Layer Hard Head Spray to increase firmness. Why not be hard headed? Use Hard Head Spray for relentless hold and control. Dries instantly. Be bold. Defy gravity, the more you use the harder it gets. Alcohol Denat. (SD Alcohol 40), Isobutane, Hydorofluorocarbon 152A, Octylacryamide/Acrylates/Butylaminoethyl Methacrylate Copolymer, Aminomethyl Propanol, Triethyl Citrate, PEG/PPG-17/18 Dimethicone, Parfum (Fragrance), Hydoxycitronellal, Linalool, Citronellol, HEzyl Cinnamal, Limonene, Phenyl Trimethicone, Pentaerthirtyl Tetracaprylate/Tetracaprate, Amp-Isostearoyl Hydrolyczed Wheat Protein, Ethylhexyl Methoxycinnamate, Quarternium-52.